General TNI (Ret) Susilo Bambang Yudhoyono, popularly known as SBY, was born in Pacitan, East Java, on 9 September 1949. He graduated from the Military Academy in 1973, top in his class. He received his fourth star in 2000. 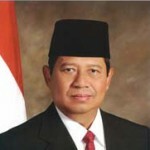 In the first-ever direct presidential election in Indonesia in 2004, Susilo Bambang Yudhoyono, running on a platform for a “more just, more peaceful, more prosperous, and more democratic Indonesia”, was elected as the 6th President of the Republic of Indonesia, gaining a landslide 60% of the popular vote.